“Where are all the people of color?” This question has come up frequently at gatherings during my 20 years with the Catholic Worker (CW) movement, a network of faith-based intentional communities that focus on direct service (often hospitality to the homeless) and justice work. Our current movement seems to attract largely white, middle class folks (myself included), and while our lack of racial diversity has been noted, we haven’t made a lot of progress in becoming more inclusive. In the past few years, CW communities in St. Louis and throughout the Midwest have been doing some exciting (and scary!) work examining ourselves, changing communal structures, and reaching out to become more anti-racist communities. For white folks, dismantling white supremacy first requires an honest reckoning with ourselves as both individuals and communities. This work can be vulnerable, messy, and painful and needs to be an ongoing process. Secondly, it requires white-dominated communities to build relationships and concretely support organizations led by people of color, using the resources at our disposal—property, finances, a broad network of support, newsletters, and other means of communication—to uplift the work these groups are doing. These are two essential “feet” of anti-racism solidarity, and cannot be done well in isolation from each other. If we try to engage in action without first examining the damage our own whiteness and racism has done to us as individuals and communities, our efforts will be surface-level at best, and can do real damage at worst. Alternately, if white people remain in the realm of navel-gazing without taking action, we can end up becoming paralyzed in our own self-righteous anxiety. I’ll recount some concrete examples of both of these strategies. We were very nervous to talk about simplicity and voluntary poverty, because they are central tenets of our movement. As we talked about both the ideal, and the current practice of it in our own community, we asked: Does our practice of simplicity presume that members begin with some level of material wealth? In what ways does “downward mobility” appeal only to those who have experienced a life of financial stability? How do poor and working class people interpret this value? Does our practice of this value acknowledge the differences between voluntary downward mobility for middle class folks, and achieving economic stability for poor and working class folks? We also looked at our writings on nonviolence, a central principle of the Catholic Worker since its inception. In the midst of the Ferguson uprising here, and the Black Lives Matter movement nationally, our community has heard the feedback that people of color are fatigued and angered at white people trying to dictate how they should respond to racist oppression. We’ve also noticed the ways that the term “nonviolence” has been used to silence the voices of people of color to actually promote the status quo. We also see that the behavior that white folks label as “violent” is very often a reflection of a culturally-white practice of politeness and compliance with police and state power. Speaking for myself, adding these nuances has been vital to my growth as someone who seeks to exist in the Catholic Worker movement and also be an accomplice/ally to our local Black Lives Matter movement. It’s often difficult for white people to recognize how racism may be playing out in our communities. All communities have a specific culture: expectations, assumptions, shared values, beliefs, and symbols that are generally accepted without too much thought. We create culture out of our own socialization, experiences, and identities that we bring to community. Culture is powerful precisely because it affects everything from an underlying level, like the air we breathe. Our community has used the following list of ways that white supremacy shows up in the group culture to help us unveil how racism is operating in our community. This tool is from the Catalyst Project and Criss Crass, with summaries created by the St. Louis Anti-Racism Collective. As a mostly white community, we have come to understand that external tools like this are essential to help us become more self-aware in examining our practices and underlying assumptions. Is it an expectation that people joining our community will learn about the culture and history of the folks we serve and the history of the land on which we are working? In what ways does our community prioritize efficiency over relationship-building? Does our community recognize that a white-led community has specific cultural ways of communicating and of running meetings, campaigns, and programs, which can inadvertently marginalize people of color? In talking about protest and direct action, does our community recognize that there are different risks for black, brown, and undocumented activists? When our community addresses issues like homelessness, war, or climate change, do we name and challenge the intersection of racism with these issues? How have we treated injustices like climate change and war as if they affect all people equally? In what ways are white people in our community encouraged to speak in newsletters, to volunteers, and publicly as experts on subjects that disproportionately affect people of color (while groups and people of color are often ignored or not believed)? If our community addresses an issue that disproportionately affects people of color, are they in leadership on our projects and campaigns—or even at the table? Does worry about the perceptions of our (mostly white) members and donors prevent us from taking strong stands against racism? Are the white folks in our community willing to share power, and have less control? Do we get stuck on the questions, “How can we get more POC to join our group?” or “Why don’t more people of color realize how important this issue is?” without doing any deeper digging? Has our community prioritized building relationships in our neighborhood, and with the local groups led by people of color? Has our predominantly white organization ever used black and brown icons (like Dr. Martin Luther King, Jr., Gandhi, etc.) to further our mission without challenging present-day racism? Is our community supporting local or regional efforts led by people of color? As we move from introspection to action, knowing that the two are both ongoing, constant, and self-feeding processes, I’ll give some examples of recent actions taken by Midwest Catholic Worker communities. These communities, most of which are majority-white, are doing work to address their own racism, change their structures, and support local groups led by people of color. Appreciating that dismantling white supremacy cannot be done within a white bubble, many Midwest communities have begun to deliberately partner with groups and organizers of color. Instead of trying to get people of color to join them, these communities are supporting organizations where people of color already feel safe and welcome—even if they do not philosophically align 100 percent of the time. Understanding that racism makes it much easier for white communities to raise money, the Minneapolis CW has committed to tithing a portion of its fundraising efforts to organizations led by people of color. Many Midwest communities are doing both internal and external education on de-colonization, racism, and white supremacy. Communities have led book discussion groups on Witnessing Whiteness and Waking Up White. Other have brought local anti-racist speakers to lead discussions. Noticing that material support is a concrete way to support groups led by people of color, many communities are sharing their space, volunteers, and resources. The St. Louis CW organized, and directly offered hospitality to out-of-town activists during the national #FergusonOctober demonstration. The Minneapolis CW has cooked food for events that they themselves were not leading. In Chicago, the Su Casa community re-purposed a portion of their building to provide low-rent office space to the #LetUsBreathe collective. The Milwaukee CW redirected a large bequest that they had received to help cover some of those costs to make the necessary repairs. #LetUsBreathe plans to convert even more of their space to welcome organizations typically excluded from access to affordable and private meeting space in Chicago. 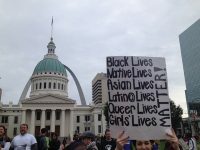 Recognizing that structural changes are necessary to combat white supremacy, the St. Louis CW has adjusted many policies and practices. We wrote down and published our process for accepting new guests and new community members in order to be more transparent. (A particular way that racism shows up in communities is when we base membership on “who you know” and therefore also subject it to the implicit bias of current members.) We are more intentional in how we welcome volunteer groups, trying to balance the (sometimes opposite) needs of volunteer groups seeking “face-to-face” interactions with the privacy of our guests who consider Karen House their home. Our weekly meeting features questions that presence our efforts to combat white supremacy: “How have you brought people of color closer into your own life and the life of the house? What are you doing, especially with self care, to combat the sense of urgency and scarcity?” In our newsletter and website, we seek to amplify the voices of those impacted by violence and oppression, rather than speaking on them as (white) experts. White folks (myself included) in majority white intentional communities must reckon with the ways that racism has isolated us and limited our communities. Our radicalness, good work, and good intentions do not make us immune from racism. Geographical proximity to communities of color does not automatically grant us the badge of “anti-racist community.” Our sense of being countercultural should not morph into an arrogant delusion that we are not influenced by white supremacy. This engagement requires vigilance, vulnerability, and bravery. And our liberation as white people absolutely depends on it. Author acknowledgments: I’m grateful to Brenna Cussen Anglada, the current and past members of the St. Louis CW community, the St. Louis Anti-Racism Collective, and Annjie Schiefelbein, all of whom contributed ideas, editing, and content for this article. Jenny Truax has been a member of the St. Louis Catholic Worker since 1998. She does anti-racism education and action with several St. Louis groups and has a deep love of all things related to Star Wars, pit bulls, and tennis. She also maintains the website of the St. Louis Catholic Worker, which has a vast repository of anti-racism resources: www.karenhousecw.org. I’d love to hear more from people of color who were the first non-whites in their community. I feel like I’ve had a lifetime of thick skin against open racism, and as such I’d rather deal with hate than to be a token. With so many communities hungry to diversify, it puts so much pressure on the first person(s) of color to enter a community because they are the best tool for attracting more racial diversity. If my goal is to diversify a community, then great. Being the first PoC is the best way to do that. But if my goal is to live simply and be treated like everyone else, well, I’ll take racial hate over tokenization any day of the week. The only way I know of avoiding both is to join a community that already has PoC.